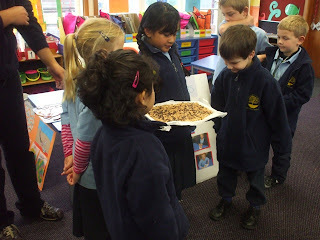 Today Room 8 went to Room 2 our Year 1 ‘Buddy Class’ to find out what they had learnt about the earth. They had three groups: one learnt about the earth inside and out, another about rocks and the last group learnt about volcanoes. 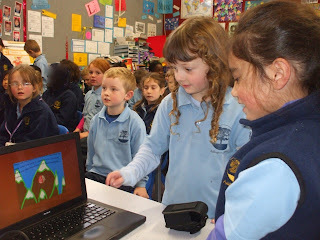 The Earth Group made a KidPix presentation telling us all about the earth. Mrs Craib said it was because they didn’t want to talk too much. We found out lots of interesting things - like sand is made from broken down bits of rocks. The Rock Group told us all about what rocks are made of. If crystals cool fast they look like glass, but if they cool slowly they look like ice crystals. They made some yummy rocks by melting butter and marshmallows to make the magma and adding rice-bubbles for the minerals and chocolate bits for the crystals. At the end we got to taste some and it tasted delicious. The Volcano Group knew heaps about volcanoes. 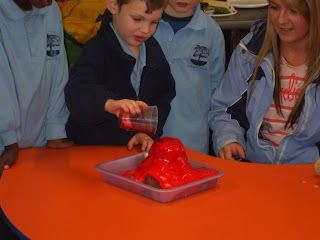 They made a volcano and showed us how it erupted. It was all very interesting and amazing.